A while back I made a cartoon about Subway’s goofy way of arranging cheese on their sandwiches, and I learned something after posting it up on the site: people are very passionate about cheese. I’ve gotten more commentary on that comic than any other so far. I love your subway cartoon, I work at subway and printed your toon. The staff found it funny, my boss did not!!! 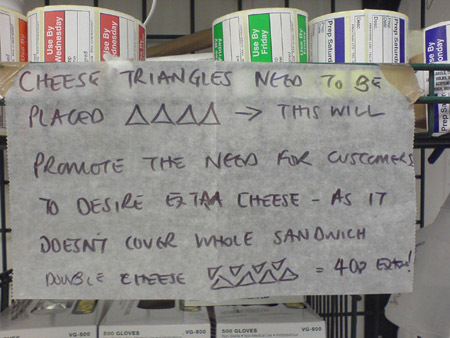 Next day a notice was put up about cheese! And I took a photo to send to you. Remember that all subway stores are franchised owned so every store will be run in its own way, and this notice is only from my subway. And he’s right, so we can’t make the same statement about all Subway locations, but this is the best explanation I’ve seen for why cheese placement might be an important part of a business model. Who knew? This entry was posted on Monday, September 10th, 2007 at 8:06 am	and is filed under Uncategorized. You can follow any responses to this entry through the RSS 2.0 feed. Responses are currently closed, but you can trackback from your own site.